I just wanted a simple, cool, comfy outfit to wear to church. Something that didn't require a whole lot of planning, preparation, or spandex. Something simple and sweet, yet dressy. So out came That Little Black Skirt, my old reliable friend. I picked up this little black skirt at Target two seasons ago and I am still madly in love with it. It is so comfortable with the elastic waist band, it's the perfect length, and it goes with anything. Just put on a top, any top, and it will work. Don't believe me? Check out THIS POST where I wore it with two different tops. 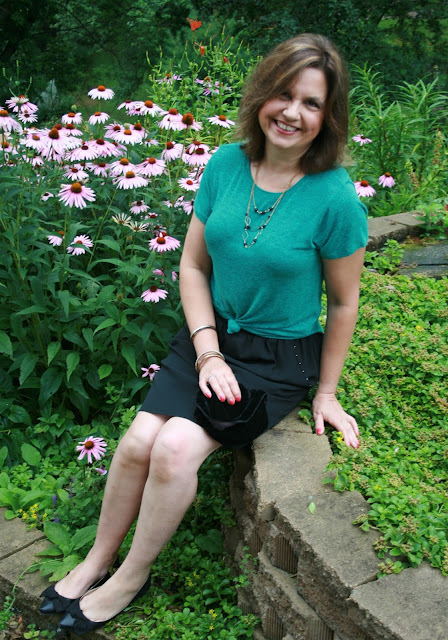 My top is new this season, but I showed it to you before in one of my Stitch Fix posts. It's actually a hi-lo tee shirt. I just tied the front in a knot and let the back hang down a bit. I love this shirt because the material is so soft…it feels so cozy! The emerald green color is so pretty, and it also has little specks of black in it which makes it even more interesting. My pointy toe flats are from Express (old). They have a snakeskin print on one half, and black suede on the other half. There is a also a pretty velvet bow on top. Since I was driving to church with my husband I didn't need a big purse, so I pulled out a vintage black velvet clutch from my closet. It was my mother's, and probably her mother's before that…so it's very old, but still in very good condition. It is just large enough to hold my IPhone, a tube of lipstick, a small trial size bottle of hand lotion, and some breath mints. What else does a girl need when her husband's around to pay for everything? My black and gold necklace I picked up on a clearance sale when on our last vacation. I continued the black and gold jewelry down onto my wrists as well. As if the elastic waist wasn't enough of a comfy factor, this skirt also has pockets! Nothing I like better than a skirt or dress with pockets…and these pockets even have cute little rhinestones on them! Yes, I love my little, reliable, black skirt. It never seems to fail me. I'm sure this won't be the last time you've seen it either. What a versatile skirt! I love this color on you and the flowers in the background are gorgeous! Love the color of this top! great shoes, too! I like the knotted t-shirt with that skirt! Such a cute look on you, love the color of the t shirt and those shoes are fab! Love the color of the top and those shoes are fab! I'm with you on having a piece that is your go-to - that always looks good with whatever top you put with it. Great skirt and I love the teal green top with it! A black skirt is a classic piece that every woman should have in her closet. You look great. A good fitting basic black skirt is a must and it looks like you've found yours! Great look here. 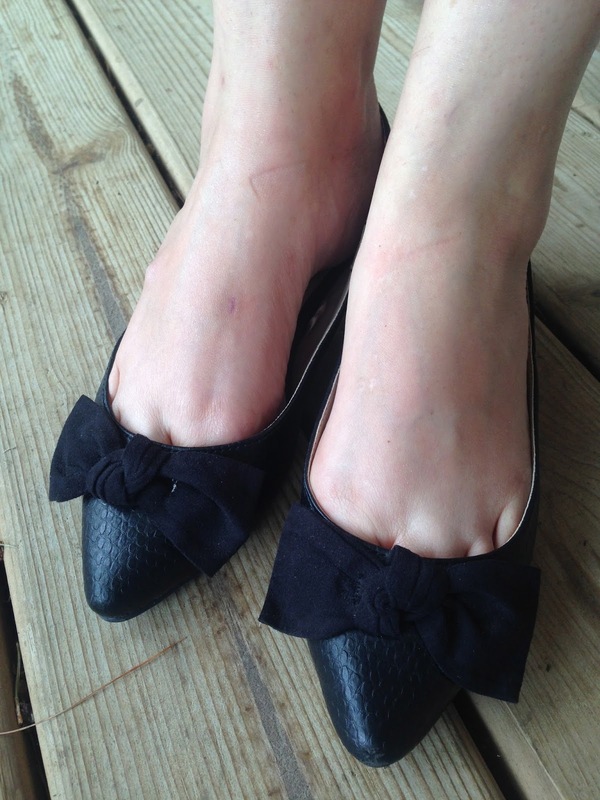 I also love the ballet flats, so very pretty with the bow. This looks great Amy, love the teal color on you, and the bow flats are my favorites, I love bows on shoes!